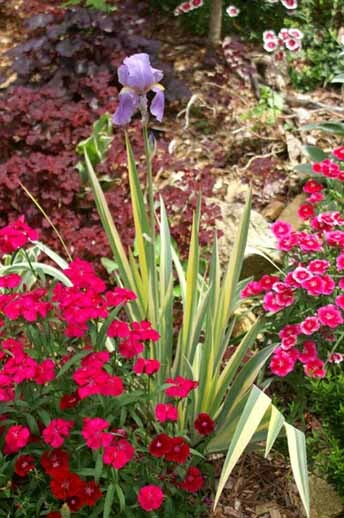 A class of novelty irises with stripes or bands of white or yellow on the leaves are termed variegated. Sometimes the variegation is of a bright white, sometimes yellow. It is prefered if it is a consistent band on each leaf and not an irregular stripe here and there. Irises infected with virus may show small narrow streaks in the foliage that should not be confused with true variegation. We are attempting to develop a list below of Irises with this trait. Please add any that have been missed by commenting in the comment box. Tall Bearded: 'Bold Stripes', 'Cream Cockatoo', 'Fantastreaks', 'Folvar', 'Quite The Same', 'Striped Britches', 'Striped Jade', 'Tricerabottomz', 'Verdict', 'Zebra', 'Zebra Blush', 'Zebra Halo', 'Zebra Night'. Variegated Beardless Irises: Laevigata Variegata., Foetidissima Variegata, Pallida Argentea, Pallida Variegata, Pseudacorus folis variegata.